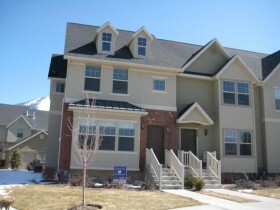 This is a Mapleton Utah Harvest Park Townhome that is currently sold. The Harvest Park townhome was sold by Team Teasdale Realty. It is located in the Harvest Park Subdivision in Mapleton. The townhome featured over 2,200 square feet and had a very nice floor plan. This unit that sold was an end unit. The Harvest Park Subdivision is very nice and well layed out. It has a variety of homes, townhomes and twin homes with lots of open space and playgrounds. The people that live in the community enjoy the club house. Nebo school district is currently building a new elementary next to the Harvest Park Subdivision. Interior Feat: Bath-Sep Tub/Shower, Closet-Walk-In, Dishwasher, Disposal, Gas Log, Hardwood Floors, Jetted Tub, Master Bath, Range Oven Free Std. Are you looking for a Harvest Park Realtor? Paul Teasdale lives within walking distance of the Harvest Park community and he is very familiar with the Harvest Park Subdivision. If you are thinking of buying or selling a Mapleton Utah Harvest Park Townhome contact Paul Teasdale with Team Teasdale Realty.